Today, the World Health Organization released its annual report on malaria, documenting continued progress in reducing deaths from the disease, which occur primarily in children under the age of five in Sub-Saharan Africa. 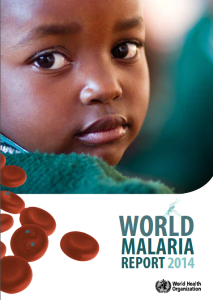 The 2014 World Malaria Report only tracks changes through December 2013. The end-2013 result of approximately 437,000 child deaths from malaria in Africa represents an almost 60% decrease in the mortality rate since we collectively became engaged in fighting malaria. With the record production of insecticide treated bednets of more than 200 million in 2014, we expect additional significant reductions in child deaths by the end of 2015. These nets should provide protection to over 385 million people. With this, plus expected progress during 2015 itself, a path to reaching the target of fewer than 100,000 child deaths from malaria is now clear. The powerful partnerships among the UN agencies, donor countries like the United States and the United Kingdom, the Global Fund to Fight AIDS, TB and Malaria, the World Bank, UNITAID, and many others have put a world with near zero deaths from malaria within our grasp, and calls for eradicating the disease are growing ever louder. To get there we have to address the obstacles threatening greater progress. We must develop and deploy the next generation of drugs and insecticides to take us to the next level and also fight the emergence of resistant strains. We must creatively identify resources to fill the existing funding gap required to maintain and build upon our progress in 2015. And finally, we must ensure that malaria control is a top priority in Ebola-ravaged countries during the months ahead. The same collaboration that has enabled our successes with malaria can deliver the surveillance and response systems capable of tackling not only Ebola but other global health threats as well. The current situation calls for intensified efforts to lock-in our lifesaving achievements to date, lay the groundwork for elimination of malaria worldwide, and to forge ahead to reach the milestone when not a single child will ever die as the result of a mosquito bite. The 2014 World Malaria Report demonstrates that our progress has been outstanding, and with 387 days remaining to meet the Millennium Development Goals, we know that even greater progress is possible.